Thanks for stopping by today! I'm excited to share a wintry card I made as part of the Pazzles Design Team Holiday Blog Hop. To make the winter scene behind the house, I sewed two pieces of plastic bag together. I left a small opening to add glitter, sequins and die cut snowflakes, and then finished sewing the pocket closed. 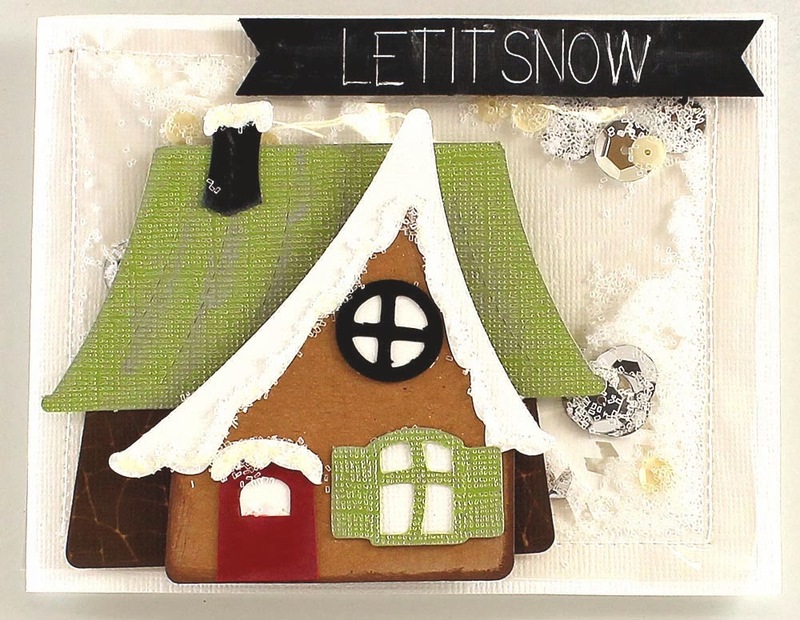 I used the Christmas Cottage and Snowflake files from the Pazzles Craft Room for this card. Hop along to each of the Design Team Member's blogs and leave a comment. One lucky blog hop commenter will be chosen to win a Digital CD Download of their choice. Leave a comment on each designer's blog post, as the prize winner will be chosen randomly from one of the blogs. Comments will close on December 5, 2013 at midnight and the winner will be announced December 6, 2013. What a fantastic card Michelle! Love all the snowy details! Michelle I love your idea of making the pocket from two plastic bags and adding your glitter. This is a great tip and one that I will be trying. Your card is wonderful, thank you for sharing. Wow Michelle! What a wonderful card! So creative and festive. Lots of great detailed elements here! I'm so glad to discover your inspirational blog. I never would have thought to sew 2 bags together to hold glitter - love it! Great idea for the glitter, Michelle! You always come up with the most ingenious ideas. Love the blog hop! Thanks! Very pretty! I love learning new ways to do things! What's not to love about snow? Beautiful card and the cute cutting files. Thanks for the inspiration. Very cute Michelle--cool idea with the plastic bags. what a cute idea. How simple to use the baggie to make a shaker card. I'll have to use that idea! Great idea using the plastic bags. I'll have to try that. Thank you for sharing. Love your card design--doesn't look like any of my original posts worked, good thing I checked! I know just who I'm going to give this to...How adorable!!! I know just who I'm giving this to..this is TO adorable! This is amazingly creative, as are all your designs! Thank you! What a great idea Michelle. I love it! This is so fun BTW! I always love your designs and classes too. Love the "shaker" idea for the background. Great job. I am not very good at sewing on paper or plastic but I can see a way to duplicate this background without sewing the bag ;) Great design Michelle, Thank you! Such a cute card design Michelle, love all the detail. I am loving going to all the sites. I am getting so much inspiration for the holidays. Love the idea! Nice card! I love the crooked house. Never thought about sewing a plastic bag together to make a glitter pocket. cute idea with the sequins and such behind the house. Nice card. Fantastic idea and great card. Beautiful! I love all the details! great card......I love the snow. Lovely card - I like the cottage and would never have thought of the plastic bag backing which is so effective. My absolute favorite card, the little gingerbread houses. Beautiful! This is my absolutely favorite card image, thanks for sharing your plastic bag technique that is a keeper. Love the blog hop. Great idea. A lovely bag idea. So many other possible uses for it. Will be using this one. Cute card. Happy crafting. I never thought of using plastic bags, how cool, thanks so much for sharing. Great idea with the bag. Really cute! Seriously cute! A shaker card upcycled! a plastic bag. Will have to use it on my cards. What a fun idea to to add the real look of a winter wonderland!! what a cute and clever card! I love love love the fact that you sewed two bags and added you glitter. It really adds a lot of dimension and interest to your card. It just fabulous! I love the snowy background, what a great idea!!! Super cute! The whole plastic bag thing "AWESOME" What a super cute card. Great! I am and have so much to learn! Love how you used the little cottage. Makes me want to knock on the door and join you for a cup of spicy apple cider by a cozy fire.